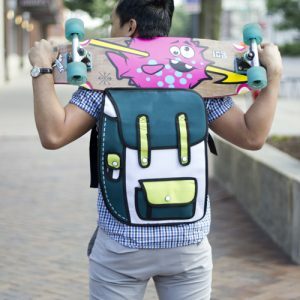 Home of 2D Bags - 2D Backpacks - SALE! DON’T JUST STAND OUT FROM THE CROWD. Welcome to the official home of 2D BAGS. We are experiencing a huge amount of traffic and orders of our bags and backpacks. As always, our USA based customer support is top notch and we will help you out with questions you may have. Thank you in advance and please contact us if you need assistance! In the meantime, check out The Huffington Post article that featured us as the #1 Backpack for girls! If you live or are near the Los Angeles area, come visit 2D BAGSTM NOW! Sometimes, you just have to see them in person. Mentally prepare yourself to see that they actually really do look hand drawn! We are located in the Westfield Santa Anita Mall in Arcadia, CA. Right at the entrance of Nordstrom in the lower level. Grab Your Cartoon 2D Bags 2DAY! SHOP THE 34% OFF SALE NOW! Limited Time! We love 2D bags and hope you will too! There are so many 2D Bags, it’s almost too hard to mentally process. But what if you could get your hands on one? Don’t delay! You’ll be wowing your friends in no time. Take advantage of our FREE SHIPPING offer on each and every 2D Bag and our 34% OFF SALE FOR A LIMITED TIME ONLY! BUY NOW! All you have to do is pick and choose your perfect bag from our wide selection of styles and colors. Which ones will you pick out for yourself or your loved one? It’s the perfect gift in 2D! Nothing beats a practical but yet fashionable present. In a world where all fashion styles seem to blend together as one, it’s important that YOU decide to make your own BOLD statement. 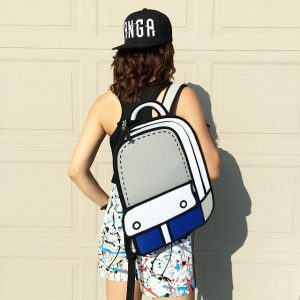 As featured on The Huffington Post and countless times on Reddit, choose the number one seller of 2D Bags and 2D Backpacks, take your wardrobe to off the chart levels! Your friends, your mom, and strangers alike will be giving you compliments. So when are you going to claim your individuality? Grab your 2D Bag 2Day and experience the 2D Life.